The bright gems are back to form more amazing cascades for you to explore! Are you ready to clear the board and destroy them all? 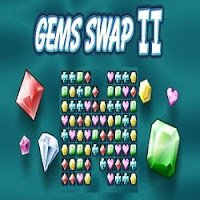 Your target in this game is to swap the positions of the gems so that at least 3 pieces of the same kind form a horizontal or vertical line and then be destroyed. When the game starts, numerous gems of different shapes and colors will be placed on a large block. Click to swap the positions of any two adjacent pieces on a horizontal or vertical line, and connect 3 or more identical pieces horizontally or vertically so that they can be removed. When all pieces in the block are destroyed, you can proceed to the next level. The timer on the left of the screen will indicate the remaining time, and when time is up, the game ends. Complete your gorgeous collection of shiny jewels and earn flashy prizes now! This Gems Swap II game is part of Action Games. 1. Eye Test-Picture Puzzles to find hidden Letters/Numbers : Do test your eyes and observational skills to find hidden letters and numbers in the given picture puzzles. 2. Tough Picture Puzzles for Adults: In these puzzles your challenge is to find the hidden animals in the given pictures. These are very tough picture puzzles to test your visual skills. 3. How many squares puzzle with answer: This is an easy picture puzzle in which your challenge is to count the number of squares in the given picture. 4. Can you find hidden C? : After testing your visual and observational skills, its now the final test in which your challenge is find the hidden C in all the given picture puzzles.